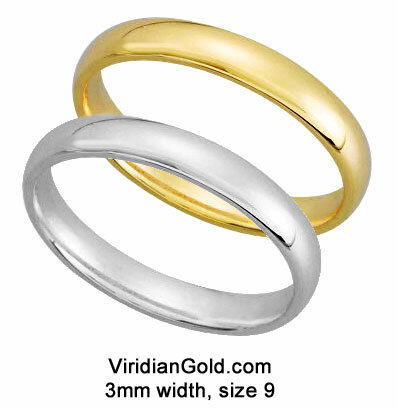 All content copyright The Viridian Gold Jewelry Store. Reuse allowed by permission only. We occasionally have a customer ask us if they can place the ashes of their loved one, or soil from a special location, into one of our lockets. The answer to that question is, unfortunately, that we do not recommend it. This is because a locket is not designed to contain such granular materials--there is usually a small gap where the two portions of the locket meet, and any material such as ash or sand will quickly escape through that opening as soon as the locket is worn. And, when the locket is opened, more of the material would be lost. But, we do carry pendants which are specially designed for just such uses. For example, pictured here is our Silver Heart Ash Memento Pendant, which is a solid sterling silver vial in the shape of a heart, accented with yellow gold plating. Because it is solid, it is also engraveable, allowing a short name or date to be inscribed--we can perform the engraving for you, just specify and order it on our website from our Engrave Your Jewelry page. 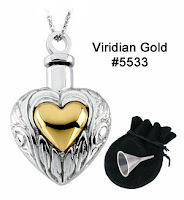 This pendant includes an 18" silver chain as well as a small funnel (shown in the photo greatly reduced in size) which is used to place the material into the vial. We also carry cross and angel design themes, and all come with a chain, funnel and gift pouch. You can find all of these on our Silver Lockets and Pendants page. So, if you want to wear your loved one's ashes, or soil/sand from a cherished location, please consider purchasing one of our pendants designed for that purpose. If you want to wear a photo, a lock of hair or a piece of cloth, one of our many designs from our Gold and Silver Photo Locket Collection would be perfect! If you're reading this post on our Viridian Gold Nuggets blog, you might notice that we haven't written anything in awhile. We missed Easter, Mother's Day, Father's Day - not a very good record! Since July 4th is just a day away, we're taking this opportunity to write about Independence Day lapel pins, and the difference between pins and brooches. We are pleased to offer a collection of patriotic pins (along with a variety of other styles): flag, Shield of Honor, America, "One Nation Under God", just to name a few, and one of our favorites, the USA Pin #6072 shown on the right, available with enamel, or in 14K white or yellow gold without the color accents. You might also take a look at our "St Micheal Defend us in Battle" Pin #6032, a customer favorite, available in 14K or sterling silver. To view our entire selection, see Religious and Patriotic Lapel Pins and Tie Tacks. What is an "illusion" setting? Diamonds are just plain beautiful! Let me qualify that statement, though: GOOD diamonds are beautiful. Just because a stone is actually a diamond, that fact alone doesn't make it beautiful, or valuable. That's why the old "4 C's" are so important when describing a diamond. 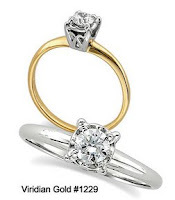 A 1-carat diamond can vary in price from $10,000 (for a VS-clarity, E-color) to $1,000 (for an I2-clarity, J-color). You can see that quality is absolutely the most important factor to understand when buying a diamond--it's what determines a diamond's beauty. So, it really is better to get a smaller stone that is of higher quality, than to have a big "rock" that is off-color and/or full of black and grey specks! Jewelry for the walking dead?